We have found some deals on laptops on Paytm Mall. The platform is offering great cashback offers on brands like Lenovo, Dell, Asus and more. 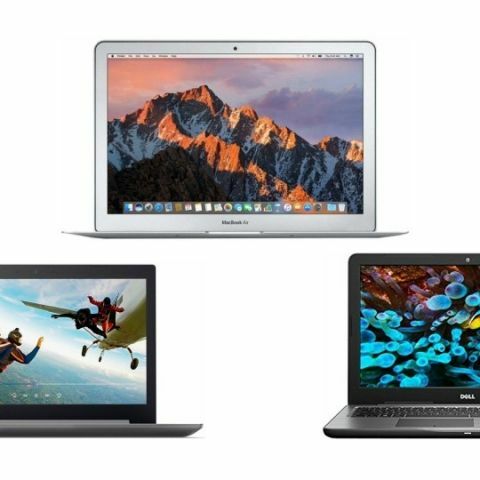 We have put together some of the best laptops deals currently available on Paytm Mall. The gadgets we’ve listed down below are from brands like Lenovo, Dell, and more. The Dell Inspiron 15 5567 features a 15.6-inch Full HD display with a resolution of 1920 x 1080 pixels. The laptop is powered by an Intel Core i3 6th Gen processor, which is paired with 4GB DDR4 RAM and 1TB hard drive. The laptop comes with installed Windows 10, so one does not need to worry about installing an OS separately. Click here to buy. The Lenovo Ideapad 320E comes with 15.6-inch HD display with a resolution of 1366 x 768 pixels. The machine is powered by an Intel Core i3 6th Gen processor with 4GB DDR4 RAM and 1TB hard drive. As per the company, it has a battery life of five hours. Click here to buy. The Apple MacBook Air sports a 13.7-inch display with a resolution of 1366 x 768 pixels. The MacBook Air is powered by an Intel Core i5 processor with 8GB DDR3 RAM. The laptop has a 720p facetime camera and offers a battery life of ten hours. Click here to buy. The HP 15-bs145TU features a 15.6-inch full HD display with a resolution of 1920 x 1080 pixels. The laptop is backed by the latest 8th Gen Intel Core i5 processor, which is paired with 8GB DDR4 RAM and 1TB hard drive. When it comes to the graphics card, it is equipped with an Intel UHD Graphics 620. The laptop is installed with DOS, which means you need to install the operating system of your choice on your own. Click here to buy. The Asus Vivobook X507UB is powered by an Intel Core i3 6th Gen processor with 4GB DDR4 RAM and 1TB hard drive. The laptop has a 2GB DDR5 Nvidia GeForce graphics card. It also features a fingerprint sensor with Windows Hello. The machine comes with installed Windows 10 as well. Click here to buy. which is the best game to play on PC/Laptop?